Fr. Ted Trinko and I arrived September 1, 2017 to Emmitsburg, and in a way, it seems that we arrived yesterday on account of how quickly the time has passed. But, on the other hand, it seems that we have already been here for years on account of what we have experienced and the graces we have received. 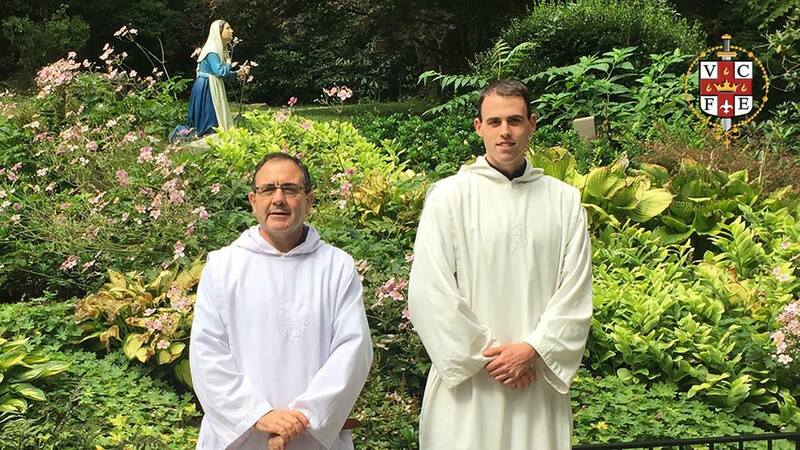 We give thanks first of all to God and to Our Lady but also to Archbishop Lori, not only for allowing us to found our IVE Monastery “Mount St. Mary’s” in his archdiocese, but also for entrusting to us the chaplaincy of Mount St. Mary's National Shrine Grotto of Our Lady of Lourdes. Deo Gratias! It is not a coincidence that Mount St. Mary's National Shrine Grotto is located on a peaceful mountain, and not in a valley, with the beautiful and gorgeous name of Mount St. Mary’s. This mount reminds us of other mountains, such as the Mount of the Beatitudes, where Christ left us a summary of his teachings for the Christian life; Mount Tabor, where Jesus Christ was transfigured; the Mount of Olives, where Christ sweat blood for us and was consoled by angels; and Mount Calvary, where Christ shed his Most Precious Blood for us. It seems that, in order to understand better the mission of the National Shrine Grotto, we cannot forget the historic circumstances that we are living in this third millennium; especially with this being a first-world country. In this day and age, although there are many bright spots, there are many shadows that hang over our era. The principle reason for this is that man has forgotten and rejected God and the Natural Law. As Pope St. John Paul II said, it is a true culture of death. However, we know that Divine Providence “disposes everything for the good of those God has chosen” and ”where sin abounds, grace abounds more exceedingly”. We are certain that in the end, the Immaculate Heart of Mary will triumph. With what has been said, we cannot do otherwise than conclude by saying that the National Shrine Grotto will continue to be a cradle of greatness: a lightning rod that will hold back the divine wrath; a magnet that will attract graces from God; a light placed on a hill to illuminate; a garden that serves to console God; an oasis that calms the thirst and fatigue of the unfortunate; but, above all, Mount St. Mary's National Shrine Grotto is a heart that beats in unison with the hearts of Jesus and Mary, who want to give life to their children. Please join us in this planning endeavor and pray we continue to hear Mary's voice so that we can fulfill Our Lord's will.